Adopting a vegan diet is something many decide to do in order to avoid supporting an industry that doesn’t treat animals well. There are also health benefits associated with this lifestyle, as long as you plan well-balanced meals. Here is everything you need to know about adding snacks to your vegan diet. A balanced vegan diet is includes more nutrients and vitamins compared to most diets. You will probably lose some weight once you start eating more fruits and vegetables, and your blood sugar levels may be easier to regulate. Some studies have also found that a vegan diet can improve kidney function, and reduce the risks of developing certain cancers and heart disease. However, going vegan doesn’t necessarily mean adopting a healthy diet. There are plenty of nutrient-poor foods disguised as vegan products sold in health food stores. You need to learn to recognize healthy and nutrient-rich foods, especially when choosing vegan snacks. Going vegan without snacking between meals can be difficult. You may find that you crave proteins and filling foods. Look for snacks that give you energy, make you feel full, and help you stay full until the next meal. The ideal number of snacks you should eat in a day depends on what your days are like. Some nutritionists actually recommend eating every three to four hours, which means you would eat a snack in the morning, another one in the afternoon, and a third small snack before going to bed. If you work out regularly or have a very active lifestyle, you might want to eat a small snack before heading to the gym. What Makes a Good Vegan Snack? Watch out for fat and sugar content when choosing snacks. Snacks with a high sugar content will cause a spike in blood sugar, which is unhealthy and will cause you to have low energy levels once your blood sugar levels drop again. High protein vegan snacks are a good option since these snacks will satisfy your cravings and make you feel full. Fiber is another nutrient to look for when choosing your snacks. Ideally, a snack should have roughly 250 calories and 24 grams of proteins. You might want to eat a snack with fewer calories before bed. Remember that you should snack in moderation. If you find that you can’t stop eating between meals, you might want to rethink your diet. There are many nutritional store-bought vegan snacks that you can add to your diet. Some of these products are advertised as vegan foods while others won’t have this label. Always check the nutritional details on a snack’s label to make sure it doesn’t contain a lot of fat or sugar. Aim for variety when shopping for snacks. You can indulge with a few unhealthy snacks here and there, but stick to a list of vegan snacks to buy that will add valuable nutrients and vitamins to your diet. These frozen desserts have a texture that is very similar to ice cream. You can find different flavors, and the best part is that there are far fewer calories and fat than in regular ice cream. Shop for chocolate made from raw cacao and with no additional ingredients. Raw chocolate is rich in antioxidants and will satisfy your cravings for sweets. Vegan cheese can be a good snack, but make sure you look at the labels to check the ingredients used. Almond milk cheese shouldn’t have a high fat content, but make sure you choose a brand that doesn’t add unhealthy ingredients. This is the perfect nutrient-dense snack that will give you the energy you need to get through your workouts. There is a whole world of dried fruit snacks to explore. These snacks are rich in vitamins and can be a fun addition to a trail mix, but avoid products with added sugar. Potato chips are vegan and there are brands like Quest or ProTings that sell chips with proteins in them. If you choose a more popular junk food brand like Kettle Chips, keep in mind that the chips will have a high carb and salt content. These could be a good snack to eat occasionally. There are several brands of crackers that have flavors free of animal products like Simple Mills grain free crackers and Edward and Sons rice crackers. You can eat these crackers with vegan cheese, a fruit spread, or with another vegan option like Nocciolata’s dairy-free hazelnut and cocoa spread. Some snack bars are sold as vegan products while other products happen to be vegan since they don’t use any dairy. You can find vegan chocolate bars, protein bars, and even quinoa bars. Check the ingredients if you aren’t sure about a snack bar, and watch out for carb and sugar content. Making your own vegan snacks at home is a healthier alternative since you have more control over the ingredients used. Here are a few simple recipes to try. This recipe is perfect for a quick vegan dinner, and you will have some leftovers you can snack on the next day. 1 tbsp toasted sesame oil. Start by cutting the tofu in as many even pieces as you want. Preheat your oven to 350°F. Press the tofu to get rid of as much water as possible. Mix the soy sauce, sesame oil, garlic and sesame seeds together in a bowl. You should brush half of this mixture on the tofu pieces. Bake the tofu for thirty minutes before flipping the pieces and brushing them with what is left of the mixture. Bake for another thirty minutes. ½ tbsp. extra virgin oil (you can substitute for melted coconut oil). Prepare the kale leaves by removing the stems. Preheat your oven to 300°F and coat the kale leaves with the oil. Sprinkle the chili powder, paprika, sea salt, and any other seasonings you want to add. 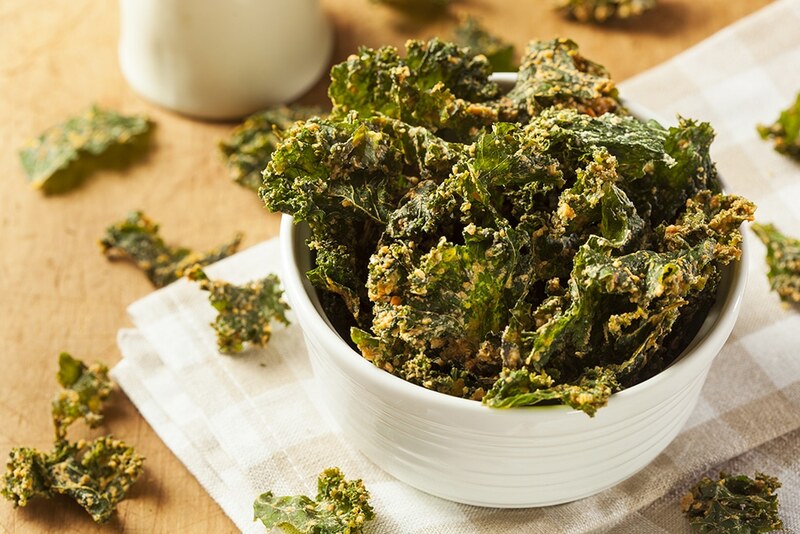 You should bake the kale leaves for ten minutes before flipping them. Bake for another 15 minutes. 1 ½ cup rolled oats. Use a food processor to chop the dates into fine pieces. You should then mix them with the oats and almonds. Use a saucepan to melt the maple syrup and the peanut butter together. Once you get a creamy mixture, add the dates, oats, and almonds. Pour the mixture into a baking pan, and cover it with plastic wrap. Let the mixture cool in the fridge for at least an hour. You should then be able to cut the granola bars. Going vegan doesn’t mean you have to give up on cookies. This apple cookies recipe is perfect if you’ve been craving sweets. 1 ½ cup oat flour. Start by preheating your oven to 350°F. Mix the ground flaxseed and the water in a bowl. Let this mixture thicken and mix the oat flour, coconut oil, applesauce, and the brown sugar in a different bowl. Add the ground flaxseed and water to this mixture before stirring in the chopped apples and raisins. You can then form cookies on a baking sheet and bake them for 15 minutes. 2 cups chickpeas (or 1 eggplant if making baba ganoush). You will need to boil the chickpeas until they have a soft consistency or bake the eggplant until you can mash it into a paste. You can then use a food processor to blend all the ingredients until you obtain a smooth puree. Note that you might need to add some water to get the right consistency. These healthy snacks will help you get the vitamins and nutrients you need while keeping your energy levels up throughout the day. Think about eliminating some of the unhealthy snacks you have been eating and replace them with some homemade vegan snacks, or shop for healthier alternatives!